We aim at solving REAL problems on REAL systems. The Department of Computer Science (CS) and Computer Centre (CC) are jointly establishing a grid computing system for supporting systems research and compute-intensive scientific applications in various disciplines in HKU. Currently, there are a total 240 servers, carrying a total computing rate 19.43 Tflops (Phase I) and is expected to grow to 25+ TFlops upon Phase 2’s completion in early 2010. 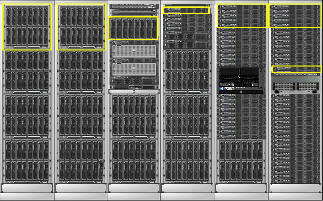 The MDRP cluster (managed by HKU Computer Center) consists of 128 blades (put at 8 chassis, two of them with built-in InfiniBand switch, the rest connected by internal Gigabit Ethernet switch). Inter-chassis connection is through a 24-port 10GbE switch. Each blade has a theoretical computation rate of 80.96 Gflop. The new cluster will serve as the main platform for the cutting-edge compute-intensive research in quantum chemistry, computational physics, computational fluid dynamics, financial engineering, environmental studies, global hydrology and nanometer studies. Fedora 11 64-bit on all SRG machines, except the IB cluster. A hierarchical network was formed based on two 24-port 10GbE Switches for inter-chassis connection, and support connection to file servers and storage servers. Host OS’es of compute nodes disseminated on-demand from a central SLIM server. All nodes in CS clusters, enable the followings in the BIOS: (i) network booting (PXE in particular) for all GbE interfaces; and (ii) the Intel VT feature. 12 x IBM iDataPlex dx360 M3 server connected by a QDR IB switch, each has one Nvidia M2050 GPU. JESSICA4: a distributed Java virtual machine with transparent thread migration and large object space support on multicore clusters. SLIM-VM: fast disseminate the Linux OS to networked machines across a grid. Gideon 300 retired on July 08, 2009 after 7 years of continuous services to the group. 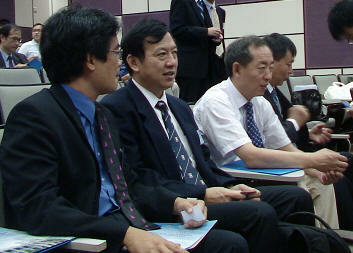 HKU Grid Point Inauguration Ceremony (Video): 27/08/2010. 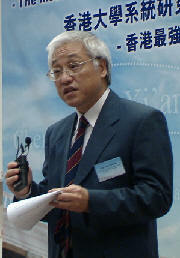 Invited Speakers: Prof. Depei QIAN, Prof. Xuebin CHI, Prof. Gang CHEN. The delivery of Phase 2 hardware was scheduled in late August 2010 and the installation work would be started afterward.